KARACHI, Aug 11 2011 (IPS) - ‘Gaming in Waziristan’, a current photo exhibition, graphically supports charges that drone strikes carried out by the United States military and intelligence in Pakistan’s tribal areas kill more civilians than Taliban. The exhibition, which ran from Jul. 19 to Aug. 5 at the Beaconsfield Art Gallery in London, will travel to the U.S. in September before being curated in Pakistan in October. ‘Gaming in Waziristan’ is the work of Noor Behram, a 39-year-old photojournalist from North Waziristan. The London showing included 70 of a collection of some 200 photographs taken by Behram over the last three years at 27 drone attack sites. The title alone suggests the callousness of “videogame warfare” and raises serious doubts about the certainty claimed by the U.S. army and the Central Intelligence Agency (CIA) about being able to hit targets precisely while sparing civilians. 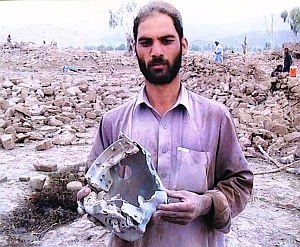 Behram’s work corroborates the findings of local journalists in North Waziristan who, supported by the London-based Bureau of Investigative Journalism (BIJ), came up with a study last month that revealed unacceptably high civilian casualties in drone (pilotless aircraft or missile) attacks. Mirza Shahzad Akbar, a Pakistani human rights lawyer, who helped organise the photo exhibition, told IPS that Behram reached the spots of 60 drone strikes of which he was able to take footage in 27. He also witnessed five of the attacks. Reprieve, which is London-based, is independently running a project on drone strikes called “Bugsplat”, borrowing the term used by U.S. authorities to describe the successful killing of significant terrorists or innocent civilians using remote-controlled missiles. Akbar, who works with survivors and victims of drone attacks, hopes the exhibition will sensitise people in the West to the human cost of ‘videogame wars’ and prod them to ask their governments how taxpayers’ money is spent on killing women and children. Khan, who belongs to the area, says that the world needs to understand that when the Taliban are a “headache for the world they would equally be a nuisance for the residents of North Waziristan. On Dec. 31, 2009, Khan’s 18-year-old son Zainullah and his brother Asif Iqbal, a schoolteacher, were killed in a drone attack in Machikhel in North Waziristan. Khan, along with Sadullah and Maezol Khan, filed a formal complaint in an Islamabad police station on Jul. 18 against John A. Rizzo, CIA’s former legal counsel. Sadullah had lost both legs and an eye and Maezol Khan’s seven-year-old son was killed in a drone strike on Sep. 7, 2009 near Mir Ali town in North Waziristan. Drone attacks started in 2004 and some 42 such strikes were authorised by former president George Bush, according to the New American Foundation. The number quadrupled under President Barack Obama. Altogether, there have been nearly 265 attacks, killing more than 2,561 individuals. Washington has routinely denied that drones kill civilians. John Brennan, U.S. Deputy National Security Advisor and Obama’s assistant on counterterrorism, has stated that because of “exceptional proficiency” and “precision” there has not been a “single collateral death”. Rahimullah Yusufzai, a veteran Pakistani journalist who helped the BIJ with its study “to see what was happening on the ground”, found Brennan’s claim to be “baseless”. After each attack, the villagers bury their dead while the militants take away the bodies of their dead compatriots to undisclosed locations. For the BIJ study, reporters were asked to personally visit concerned villages and verify data, Yusufzai said.